Are you a mompreneur who is running ragged because of your out of control office? Do you struggle to manage every piece of your life and juggle the details of several people in your family? Are there days when you just wish things were a little easier? Is the place you call “Executive Headquarters” organized, restorative and reliable? If not, let’s take a look at a fresh perspective. Getting more productive is a process. Launching a new business, or even a new program is a process. Creating business systems to support a life that works is a process. The Sanity Dimensions™ are the areas that with clarity will help you fix root problems, and move forward to create amazing results in your life and in your business. Your space is literally the place from where you conduct your business. Where is your ‘Executive Headquarters’? Where do you actually work? Do you have a physical location? Is your business run from your automobile? Or perhaps you have a different type of mobile office – like the local Starbucks! Regardless of where it is, it’s important that the space best suites your needs and your work style. Some people work much better in a busy location, while others need complete silence and isolation to complete their genius work. Regardless, your SPACE should be comprised of everything you need to do the work you are wishing to do. 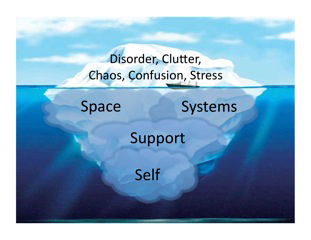 Think of your space as a command center, or the control panel of an airplane. All the tools, gauges and items necessary for you to successfully do your job should be within arms reach, or be easily found or accessible when you need them. Do you struggle with your space? Take a quick Space assessment by clicking this link and see how healthy your spaces are. Find out how you measure up. Take the Space Dimension Quiz! How do you struggle most with your Space as a mompreneur and why? What keeps you stuck? I’d love to know in the comment section below now! Or, if you have a question about your space – let me know so I can help!